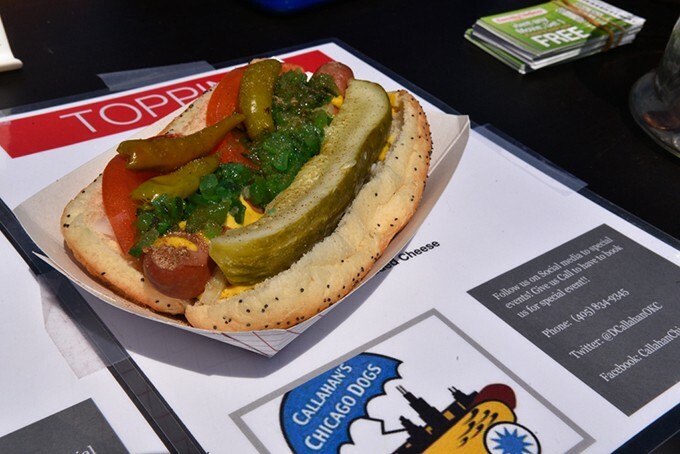 A viral Tweet allows Callahan’s Chicago Dogs to pursue a family dream. Dewayne Callahan stands near his hot dog truck in a photo that garnered over 115,000 retweets on Twitter. One of the most frustrating days of work for small business owner Dewayne Callahan turned into the most fortuitous for his burgeoning Chicago-style hot dog truck. 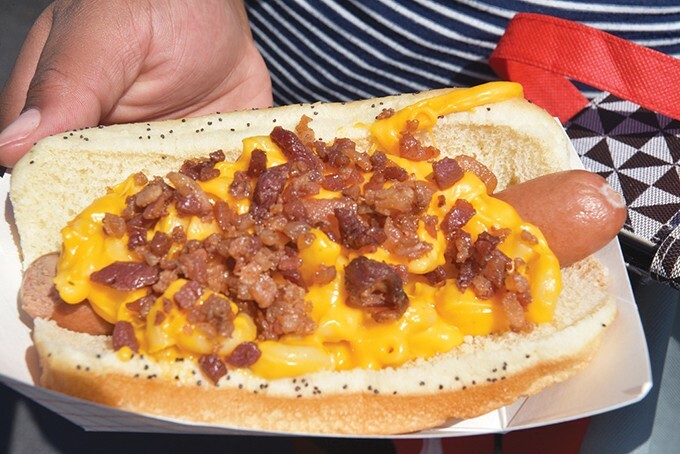 With the Oklahoma wind whipping and sales slow one afternoon, Callahan’s daughter Maddi sent out a tweet from her Twitter account showcasing her father’s hard work at Callahan’s Chicago Dogs and their newest creation: an all-beef hot dog topped with macaroni and cheese and crumbled bacon. 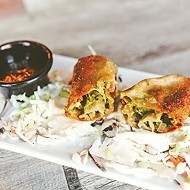 “Guys, my dad literally loves cooking so much & owning this business means the world to him. His food is seriously amazing…I don’t have many followers so this won’t get much exposure but if you see this plz RT [retweet] it,” Maddi wrote from the account @duhitzmaddii on May 19. The tweet has received over 115,000 retweets and gotten more than 160,000 likes on the social media app. The social media buzz has boosted Callahan’s Chicago Dog from a twice-a-month operation to being open five days per week. Callahan’s stepson Malik Dotson quit his day job with United Parcel Service (UPS) to manage the cart during weekdays while Callahan works as a radiation therapist at ProCure Proton Therapy Center. Callahan grew up in the Chicago area, eating hot dogs on the way to Bears, Cubs and White Sox games and has always dreamed about one day owning a stand like the ones back home. He bought his first hot dog stand in Oklahoma City a few years ago, after joining the Facebook group Hot Dog Slingers R Us — a national group devoted to providing tips and techniques for hot dog vendors. A Mac Dog from Callahan’s Chicago Dogs. “I started by working basketball tournaments with the kids, but I never felt like I was doing it the way that I wanted,” Callahan said. He bought a new cart complete with built-in steam trays about a year ago but wasn’t able to expand beyond more than two to three events per month. Those thoughts were running through his head on the fateful day in May. Callahan and his daughter Maddi were set up outside Turf Wars for a packed event filled with birthday parties, but they kept seeing families bring in pizza box after pizza box. It was the first day they added a macaroni and cheese hot dog to the menu, but after being set up for a few hours, they had only one sale. A Chicago Dog from Callahan’s Chicago Dogs. After the tweet exploded, Callahan said that he began receiving offers to set up his truck instead of him having to solicit businesses. 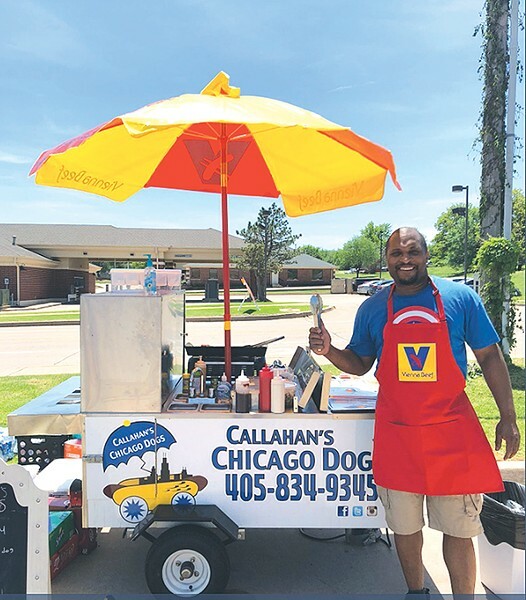 Callahan’s Chicago Dogs is usually set up during the week in the parking lot of Family Video at 7025 NW 122nd St. two to three days a week for lunch and dinner and has an arrangement with Edna’s at 5137 Classen Circle to serve 9 p.m.-2 a.m. Fridays and Saturdays. Callahan’s Chicago Dogs specializes in the traditional Chicago dog ($5), complete with neon green relish, tomatoes, pickles and sport peppers. 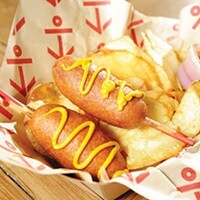 It also serves bratwurst, Polish sausage, nachos and the creation that is now call the Mac Dog ($6), an all-beef natural Vienna hot dog topped with macaroni and cheese and crumbled bacon. 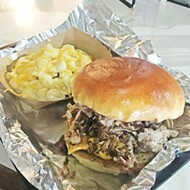 The picture of the macaroni dog in the tweet brought Luke Lupton all the way from Moore to Callahan’s Family Video location in early June for lunch. Lupton said that when he saw the tweet, he knew he wanted to support a fellow small business owner. He started Lupton Lawn Care with his brother Samuel this year. Since expanding the cart service, Callahan said that he has had to buy a new refrigerator to store the orders of Vienna Beef hot dogs, which is a Chicago institution since 1893. The first cart that Callahan bought is currently being retrofitted to remove a grill that is against city health department regulations, and he is hopeful that it will be operational in the coming weeks. 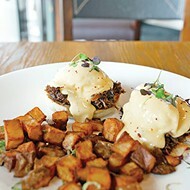 After the second cart is up and running, his dream is to open a brick-and-mortar restaurant. Follow @DCallahanokc on Twitter and @hotdogchi on Facebook for updates on times and locations of Callahan’s Chicago Dogs.